My mother always asks me to take her out on food adventures. So this year for Mother's Day, it occurred to me that I could get her the perfect foodie gift. A pair of tickets to the Red Shoe Crawl! So what exactly is the Red Shoe Crawl? 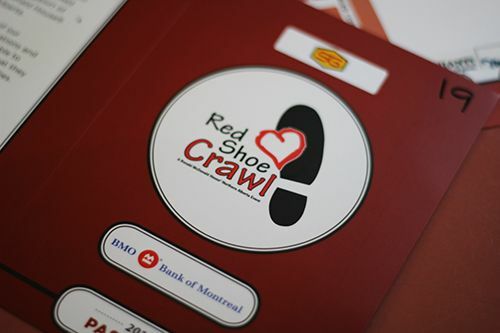 Each year, two crawls are hosted by the Red Shoe Society here in Edmonton: one on Whyte Avenue and one on 124 Street. 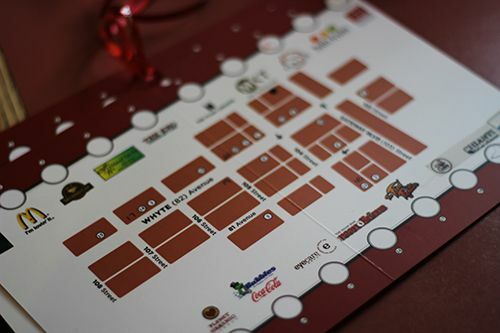 Each crawl gets a host of restaurants and other vendors in the area to donate food samples or portions of sales to the society, and all tickets sold go towards supporting the Ronald McDonald House of Northern Alberta. Culinary treats are graciously donated by the vendors, so you get to eat and raise money for the Ronald McDonald House at the same time! As this was my first Red Shoe Crawl, I was really excited to see what it was all about. I had heard in the past that other crawlers weren't able to make it to all the participating locations, so I accepted the challenge! In total, there were 20 vendors this year, which even included a local food truck! I of course was more interested in food than the sales that some vendors were offering, so I'll just highlight some of what was available! For our first stop of the crawl, we were directed to Chianti's where we were quickly seated by the hostess. As part of the crawl, we were able to each order either a cold or hot appetizer, which would be served half the size of the typical portion. 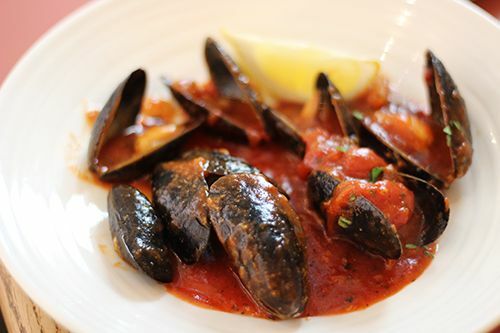 Together, we decided to try the Salmone Affunmicato - smoked salmon, capers & sour cream - and the Cozze Al Vino E Pomodoro - PEI mussels in a wine & tomato sauce. 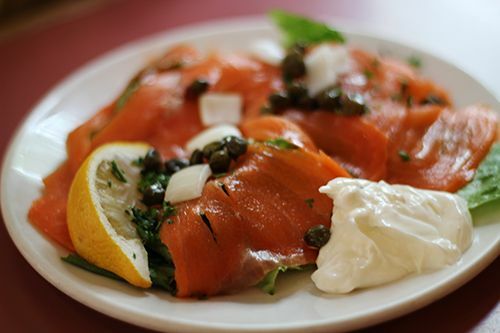 The smoked salmon itself really wasn't all too exciting, it came out just the way I expected and was your typical smoked salmon appetizer. The mussels I loved though. They were fresh, and the tomato sauce was just salty enough to still allow the true flavour of the seafood to come out. Our second stop was over at The Keg, where the menu was set for each participant on the crawl. We were given sample sizes of their raspberry lemonade, the mini keg dog, and Santa Fe Chicken Dip. 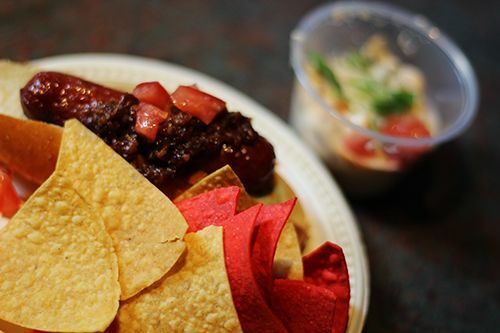 The Mini Keg Dog - beef hot dog, bacon jam, tomatoes, pesto aioli, cheddar/jack cheese - was definitely on the saltier side, but I appreciated the sweet bacon jam working to counter the savoury taste. The chicken dip - smoked chicken, cheese, chilies, black beans, peppers, chips - I actually really loved! It was served warm, the cheese was gooey, and the dip perfectly flavoured. There was lots of substance to it, and I would definitely order it on my next visit to one of their locations. Another stop along the way lead me to one of the new food trucks to Edmonton for the 2013 year - The Food Fighter! With my busy schedule, it's so hard for me to find a chance to try their truck downtown, so it was perfect that they were part of the crawl. They were offering up crostini's four different ways, and everyone was able to order one variation (I secretly wanted all four but settled for our two!). My mother chose the Magic Mushroom Crostini, served up with sauteed mushroooms and a bit of cheese. 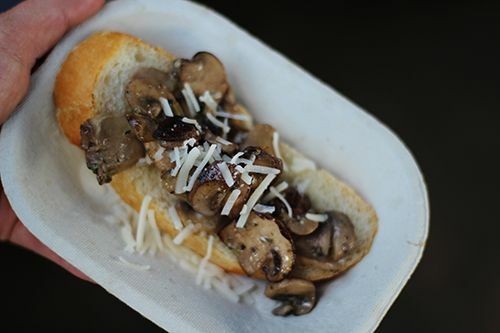 The crostini was crisp, but maintained a soft interior, and you could really taste the mushrooms. For myself, I went with the fig butter, arugula, pancetta and parmesan crostini. My crostini wasn't nice and crisp like my mother's, but the toppings were great combined together. 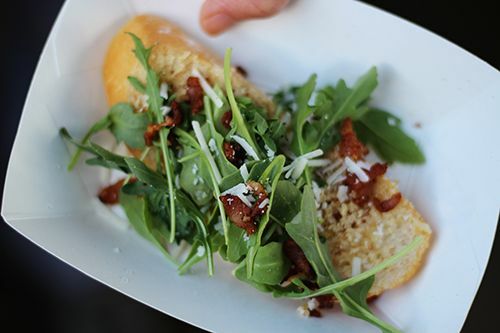 There was a freshness from the arugula to combat the saltiness of the pancetta, and the parmesan pulled it together. When I have the chance, I'm going to have to check out their regular offerings on the streets! I will admit, I've never been to Sabzy, let alone actually paid attention to it on Whyte. So yes, the crawl is a great opportunity to try out new restaurants! 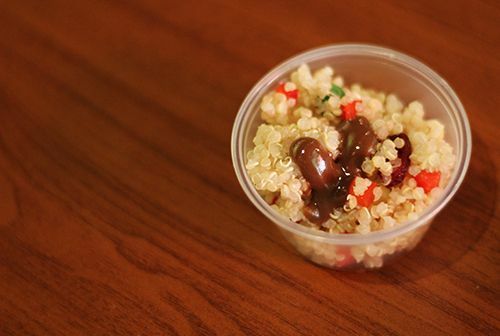 Sabzy describes itself as a Persian grill, and was offering a almond quinoa salad with a maple glaze dressing. The salad had slivered almonds and red peppers, but I was surprised to find that the dressing was quite sour and with little to no maple flavour. Another stop on the crawl was at the well known Marble Slab Creamery. 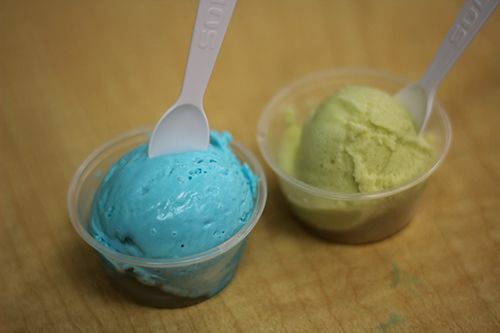 Here, everyone was allowed one scoop of an ice cream flavour of their choice - I had to go with cotton candy, while my mom went with the green tea yogurt. The cotton candy wasn't very sweet which I liked, and the yogurt didn't have much of a green tea flavour. I'm not the biggest green tea fan, but this one was tolerable, and both of our samples were creamy and a great mid-crawl treat. Our next stop on the crawl was far down Whyte, down to MKT. Their offer on the crawl was 5 oz. of any draught beer or a virgin cocktail, and one slider each. Together we ordered the local Alleykat Aprikat, and their Berry Soda which was very refreshing. 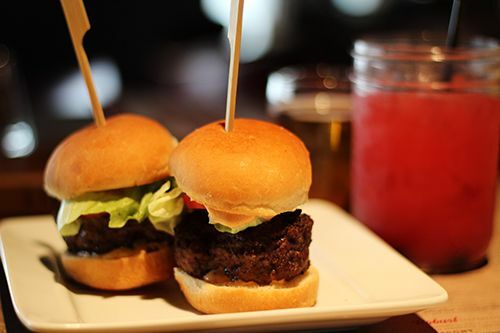 The sliders were great as well - buns were soft, patty tender, and the spicy aioli added a nice kick. Hiking back up towards Whyte, we stopped by Naanolicious, which offered everyone a Carribean Iced Tea and their Cinnamon Naan Bread. 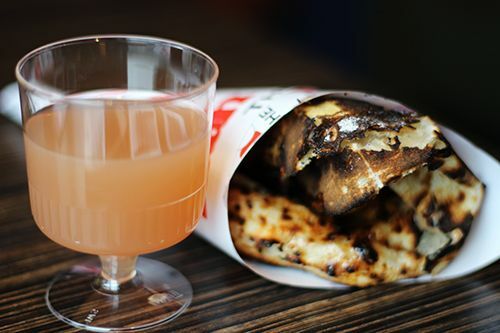 My first naan was quite burnt, which they quickly swapped out for me, but either way, the naan was soft and fluffy, with a light cinnamon flavour to it. The buttery sweet bread was a nice sweet treat. Last but not least, we finished our food-filled day with some frozen yogurt at Tutti Frutti. 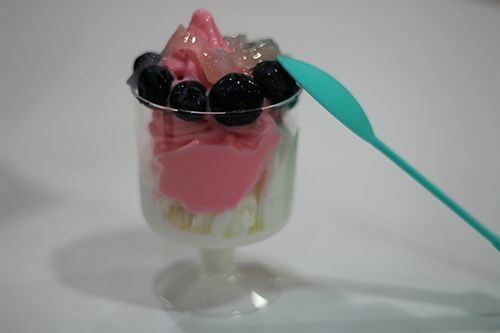 I had to go with the watermelon and tart froyo topped with blueberries & lychee jelly. Pretty funny considering my mother practically crafted the same frozen treat as I did. Like mother, like daughter? For a food crawl that ran from 1-5PM, there was tons of food to eat! We actually ate much more than what's pictured here for you! Some additional items? A vanilla ice cream cone from McDonalds, a cookie from Crave Cupcakes, a hot dog from Planet Organic, a cup of tea from Cha Island Tea Co., iced espresso from Second Cup, so yes, I was pretty full! Unfortunately, Yianni's seemed to have missed the memo, and didn't open until 5PM that day, when the crawl was to end. Maybe a good thing considering how full I was! Also, participating vendors like The Plaid Giraffe and Ten Thousand Villages participated by giving customers a discount on their purchases. So fear not, not every stop is food, food, food! I totally got stuffed for a good cause, and would recommend this event to any of you food lovers in the future. You're supporting a great organization, and spending some quality time with friends or family outdoors and stuffing your faces! I couldn't ask for more. Keep an eye out for the 124 Street Crawl in September! omg'd andrea! i know you and your mom had a blast. what a wonderful cause! plus you got to visit some places you've never been before and taste some really cool stuff. this was awesome! wow, I'm a big foodie and I'm so jealous. All the food look gorgeous! 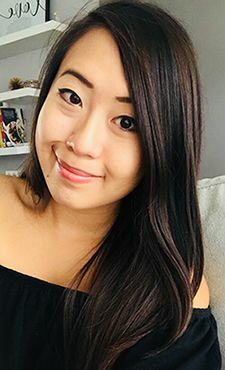 Please check out some of my looks on BestTrendsForever.com!! oh yumyum! everything looks so good! I think I'd die for that salmon dish. Yummy, yummy. Have a great day. Wow all is really yummy!